Agrippina Senior, daughter of Marcus Vipsanius Agrippa and of Julia, the daughter of Augustus, married Germanicus, by whom she had nine children, among whom was the Emperor Caligula, and Agrippina Junior, the mother of Nero. She was distinguished for her virtues and heroism, and accompanied her husband's campaigns. Obverse: AGRIPPINA M F GERMANICI CAESARIS, Agrippina senior bust, draped, right, head bare, hair in long plait. 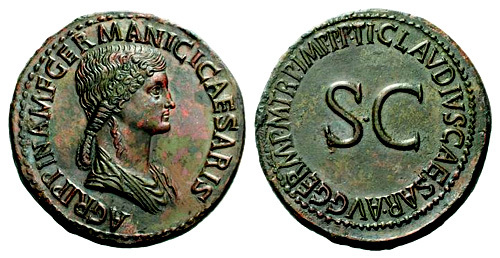 Reverse: TI CLAVDIVS CAESAR AVG GERM P M TR P IMP P P around S C.